Data Centers and uptime is assumed. Service Level Agreements (SLA) are made between groups. But, many times there are exceptions for planned maintenance/downtime vs. unplanned downtime when calculating SLA. InformationWeek reports on Google Apps/Gmail's change to this common practice. A new service level agreement (SLA) for Google Apps customers strives to make Google's cloud as reliable as dial tone. Google has changed its service level agreement for paid versions of Google Apps, its suite of online applications. The goal, says Google Enterprise product management director Matt Glotzbach, is to deliver service that's as reliable as telephone dial tone. For today's mobile generation, who may lack experience with landlines, let it suffice to say that dial tone under Ma Bell was very, very reliable. Not sunrise reliable but chances were if you didn't hear a dial tone when you picked up a handset, the phone was disconnected from the wall. Google is taking a leadership position. But with millions of enterprise customers, Google aims to become more reliable. As a sign of its commitment, the company has disavowed planned downtime. "Unlike most providers, we don't plan for our users to be down, even when we're upgrading our services or maintaining our systems," wrote Glotzbach in a blog post. "For that reason, we're removing the SLA clause that allows for scheduled downtime." Glotzbach says Google is the first major cloud service provider to make that pledge. In Google's blog post they call out the competition. 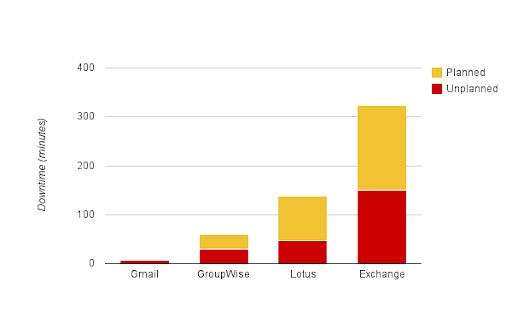 Fortunately Microsoft Exchange® customers can still benefit from the reliability of Gmail withGoogle Message Continuity. Comparable data for Microsoft BPOS® is unavailable, thoughtheir service notifications show 113 incidents in 2010: 74 unplanned outages, and 33 days with planned downtime. You may be thinking I can't do this in my data center. And you are right you can't. This solution requires geo redundancy between data centers. For a bit on some of Google's approach check out this Google presentation at Stanford University. The presentation referenced is by Jeff Dean.